This is a design I’ve built five times! I don’t own one myself, as I had other desires. 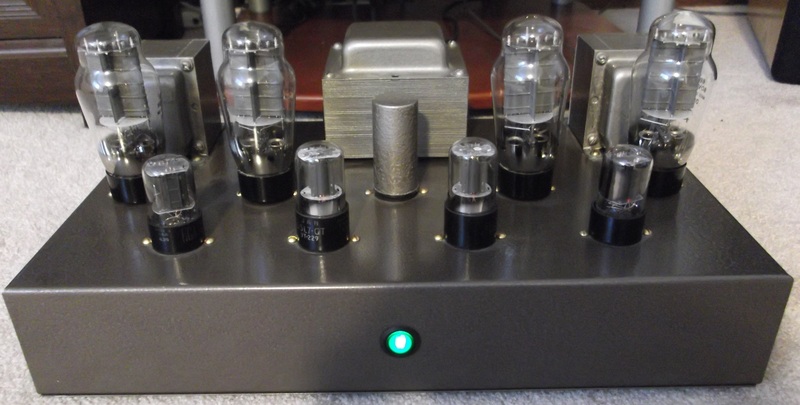 This particular one I built for my father, and he wanted it set up so any rectifier tube, including a solid-state plugin, could be used. Again we have the standard 17″ x 10″ x 3″ hammertone-painted steel chassis, this time with Hammond 1645 output transformers and a surplus power transformer. My father insisted on painting the transformers I would have kept as black. The solid-state rectifier is the painted cylinder in the middle. The completed unit puts out 15 watts per channel. This, unlike the single-ended 6B4G amp, is not a simple affair. This is a three stage circuit, using one section of the input 6SL7 as a paraphase phase inverter. The second stage is the driver, using the 6SN7, to achieve the high voltage swing the 6B4Gs require. The output stage is very straightforward, except for the connection of the cathode-bias circuitry. In order to set up each channel’s output tubes, two 6.3 volt center-tapped windings are required. The three stages are enclosed in a negative feedback loop, without any step circuits to prevent oscillation! This is possible because the 6B4G has a high input capacitance, acting as it’s own step circuit or filter. The circuit can still be unstable unless a sufficiently wideband output transformer is used. This design is a close copy of a design in the Acrosound catalog, and in this case, the Hammond transformers have a somewhat lower bandwidth. This made it necessary to carefully tune the feedback loop for stability. The end result is a solid performer with decent power, sounding unlike push-pull pentode designs. It does sound louder than the watts indicate. Anyone building this circuit should spare no expense on the output transformers.